Give the Gift of Learning! 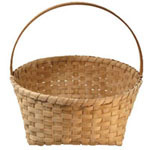 The Craft of Basket Weaving is a skill that lasts a lifetime! These “Basketry Studio A” kits are our exclusive line of more than 45 basketweaving kits, in production in our USA workshop since 1981. YES! You definitely get all the supplies you need in each kit: a generous supply of ALL materials. 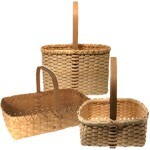 Reed, cane, hoops, handles- whatever is needed plus our step-by-step, fully illustrated patterns. Not just one or two illustrations- an average of 20 separate drawings for EACH kit pattern. Absolutely Guaranteed to turn you into a Basket Weaver! Product descriptions feature “SKILLS LEARNED”, which will help you decide which kits are best for you. Other Best Sellers below: Click on the photos for full details.